There seems to be an issue where code that should be marked as "Dead Code", is marked as "Uncovered" when using an early return in a generator.
} // This line is never covered. 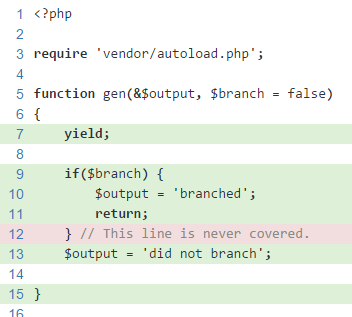 phpunit/php-code-coverage 3.0.1 Library that provides collection, processing, and rendering functionality for PHP code coverage information. phpunit/php-file-iterator 1.4.1 FilterIterator implementation that filters files based on a list of suffixes. phpunit/php-text-template 1.2.1 Simple template engine. phpunit/php-token-stream 1.4.8 Wrapper around PHP's tokenizer extension. phpunit/phpunit 5.0.8 The PHP Unit Testing framework. This seems to be because Xdebug (and VLD) don't see the "GENERATOR_RETURN" opcode as a jump (to exit) opcode. Fix on the way. Fixed for 2.3.4 and 3.0.0-dev.